The biggest problem with Constantine #7 is a lack of the title character. John is present during the events of the issue but he is largely a bystander to the action despite seemingly being the focus of attention. The plot sees three of John's enemies working together to destroy John's power and his allies while trapping the man himself. John is uncharacteristically passive while all this is going on and we see more of other magic-users and magical beings reacting to the closing net than we do of John working against it. New artist Szymon Kudranski proves a largely unwelcome change from Renato Guedes. I had been impressed by Kurdranski's previous work on Green Lantern and there are signs of the same greatness here. Strangely, Kurdranski seems to be at his best when he suggests things in the artwork rather than depicting them outright. Allow him to draw shadowy figured, half-obscured by fire and moonlight and he's quite good. Try and put a character in the light, however, and the whole affair seems sketchy and incomplete. I don't think I'll be keeping up with Constantine in the future. The book is decent but I expect more of ol' ConJob. 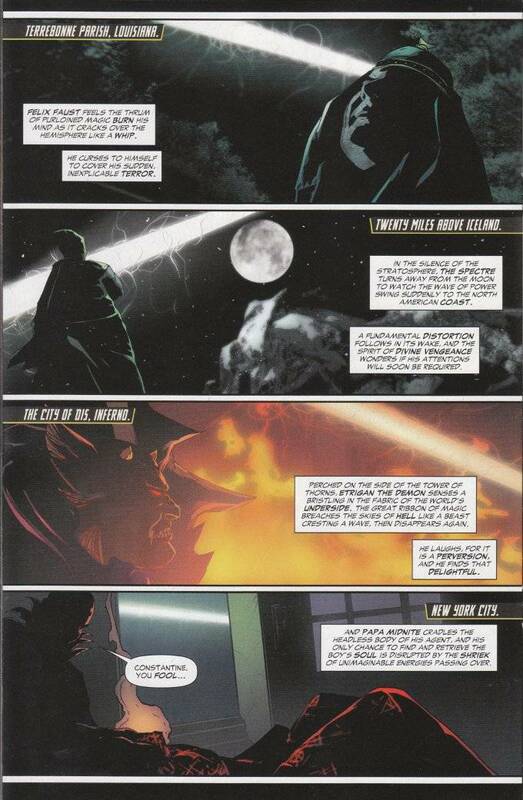 Additionally, the recent previews suggest a greater emphasis on tie-ins and crossovers in the coming months and while I do enjoy seeing John pitting his wits against the DC Universe at large again, I'd much rather his solo series focus upon John's adventures apart from Justice League Dark.